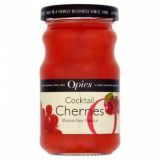 Large 1.65kg plastic jar of Opies red maraschino liquor flavoured cherries without stem. Opies cocktail cherries are used by barmen and chefs around the world to add the final flourish to cocktails and desserts. Flavoured with alcohol-free maraschino flavouring. Maraschino is an Italian liquor created by distilling Marasca cherries. Opies select the finest cherries and preserve them in their unique flavoured syrup. Can also be used for home baking - but if you are baking a cake make sure you give them a light coating of flour to stop them ending up at the bottom. 1.65kg of cherries in flavoured syrup. 850g of cherries by drained weight. Warning: May contain undetected stones. Please ensure food or drinks made with this product are not given to children under 3. Opies is the main brand of Bennett Opie Ltd one of the oldest family-owned businesses in the UK. The company was founded in 1880 by Bennett Opie a Cornish miner who travelled to London and set up a company supplying cornish eggs to London markets. 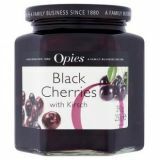 Over the years they expanded first into glace cherries and then into an ever increasing range of pickles and preserves. In 1929 they moved into a new factory in Sittingbourne in Kent where they developed world-class pickling technologies and became know as the 'Pickle People' to the locals. And today they are still manufacturing British pickles and preserves from the same site. As far as authentic goes this traditional English company is the real deal! Opies take great pride in the quality of their products. All their ingredients are carefully sourced and selected, and rigorous production processes are continually monitored. So you can always be sure that the Opies label guarantees a top quality product packed with flavour. Opies sources raw materials from the UK where possible but also uses ginger from China, gherkins and peppercorns from India, onions from Holland and cherries from Italy! Bennett Opie products are available to buy in shops in 21 countries worldwide. In October 2001, Opies was awarded the higher-level EFSIS (European Food Standard Inspection Service) accreditation certificate, a leading food safety and quality standard. Opies is also a past winner of the Queen's Award for Export. William Opie is chairman of 'Produced in Kent' an organisation dedicated to championing local food, drink, products and services in Kent. Opies takes pride in sourcing local ingredients in the UK, as well as looking further afield for quality produce, William has sourced everything from walnuts to Bramley apples picked just four miles from the factory. Unlike larger producers, the company does all of its work by hand, enabling them to craft a superior product. Today's success has only been made possible thanks to the decision to expand the business into international markets. The company has never neglected its quintessentially English roots, however we have built on our heritage to appeal to other cultures. Expanding to South Korea is part of this plan, however in the next five years, we aim to go further and for our products to be available on dinner tables in every corner of the world. Cherries (contains preservative: Sulphur dioxide), sugar, water, acid regulator: citric acid, flavouring, colour: erythrosine. This product may contain undetected stones. Store in cool dry place. Once opened keep refrigerated and use within 4 weeks. Use as required. This product may contain an undetected stone.